The May Pending Home Sales Report from the National Association of REALTORs will not be released until June 30, but I can give you a heads-up for a Tallahassee edition today. 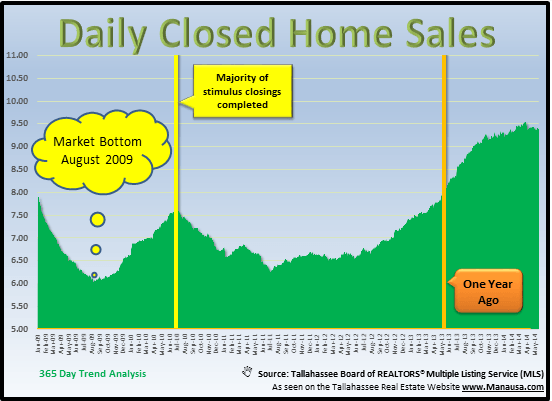 Long time readers of the Tallahassee Real Estate Blog have seen us scrutinize pending home sales since we began writing here, knowing that the count of "new contracts" is one of the most relevant statistics regarding the health of the housing market. Understanding the ever-changing relationship between supply and demand helps us determine value movement, and nothing gives us a clearer picture of "demand" than by observing the new contracts posted in the MLS. It's a shame the national reports are inaccurate and untimely, as we like to enjoy ours fresh and accurate here in Tallahassee. We have been reporting reduced new contracts in Tallahassee since mid February, and this slowing of buyer activity is finally starting to appear among the closed home sales. In the real estate graph above, we track the one-year trend of daily closed home sales. Simply put, it shows the average number of homes closed each day over the past year. By tracking the one-year trend, we are able to remove the impact of real estate seasonality on the results. The good news shown above is that we have grown more than one closed sale per day over the past year. The market has definitely recovered some of what was lost during the crash the commenced in 2006. In fact, the number of home sales each day is up more than 50% since the market bottom. The bad news is that we are just starting to see sales decline from a peak of 9.6 per day established in Mid March, and our recent pending home sales reports suggest months of decline ahead. When we take the information above and plot it against new contracts, you will see why the decline has not been a surprise to those of us who are paying attention. 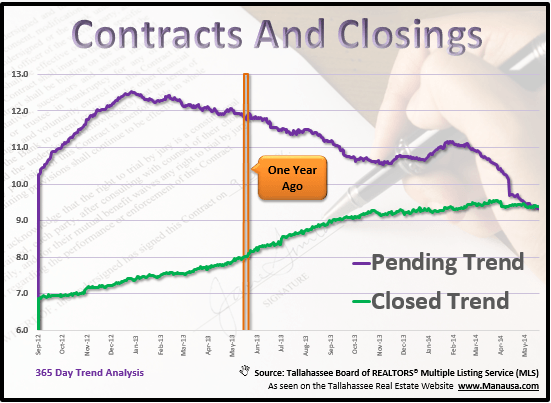 The green line above measures the one-year trend of daily closed home sales, while the purple line measures the average number of new contracts posted to the Tallahassee MLS each day. In theory, a closing must come from a contract (though there are some un-common exceptions), so we expect to find contracts higher than closings at all times. Currently, the closings trend has crossed over the contracts trend, and that does not give us much hope for the next several months of closings. Home sellers should talk with their real estate agents. Make sure you understand the current and future supply and demand dynamic for your home. You could be in an appreciating price range, or you could be in one that is falling in value. It is critical to price your home correctly for you to sell your home and move. If you would like to know more about how pending home sales impact the value of your home, just drop me a note and we can schedule a time to help you determine the best time to sell your home.